Hey hey it’s Tiffany from Creme de la Crumb back with another tasty dish for you! Today I’m sharing this fancy schmancy (not really) salad with an incredibly delicious dressing! I don’t know about you but I always feel like I’ve done a good deed by eating a salad. I dunno what it is. Even when it’s loaded with croutons and creamy dressing I still feel like I deserve brownie points. This salad though, really is a healthy salad. Wait, you mean it’s loaded with flavor and still good for you?? Yep. That’s my kind of salad. 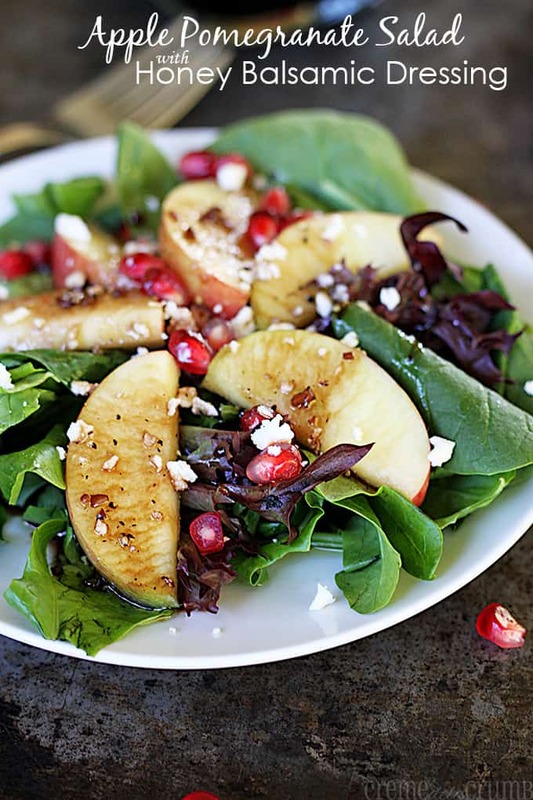 It think it’s gotta be the the pomegranate seeds that give this salad that “fancy” feel. Probably because the instant you see pomegranate seeds on anything you either see dollar signs (for those pre-seeded containers) or a lengthy amount of work and purple hands. Those of you who have shelled a pomegranate know exactly what I’m talking about. 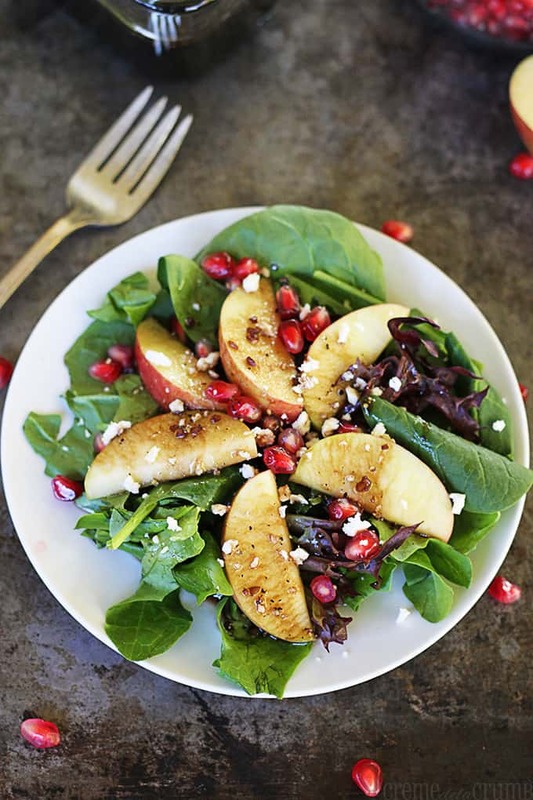 De-seeding that pretty winter fruit can be a bit of a pain but soooo worth it! There’s nothing quite like those juicy little guys. Mmmmmmmm, so good! 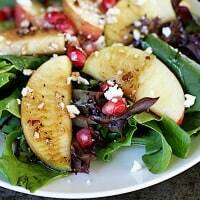 The salad dressing really tops off this whole salad with a lot of flavorful garlicky balsamic-y goodness. And a bit of sweetness from the honey. You’ll love it. Fix this salad as a side or top it with some strips of cooked chicken breast for a healthy and delicious main dish! Healthy and delicious?? Better believe it! This salad is perfect for a tasty side dish or top it with some chicken for a fantastic main course! Prepare the dressing by whisking all ingredients together until smooth. Chill until ready to serve. 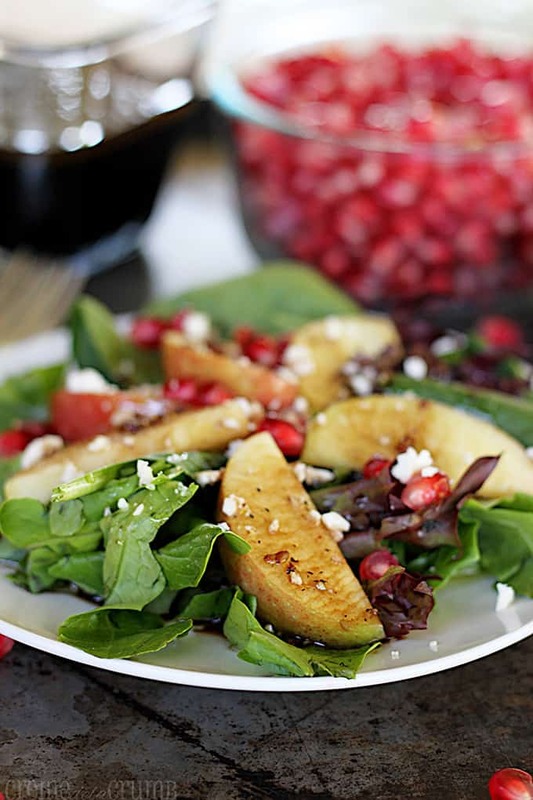 In a large bowl combine lettuce, pomegranate seeds, apple slices, and feta cheese. Toss to mix well. Plate about 2 cups of salad onto each of four plates. Top with dressing and freshly cracked black pepper if desired. If you looooove dressing and want to have a little extra for the rest of the week, double the dressing recipe!! For more recipes from Creme de la Crumb click HERE. This salad looks so wonderful. I can’t wait to make it. Pinning and sharing! Hi! I can’t wait to try this recipe. I found a YouTube clip of how to take the pomegranate seeds out of the pomegranate effortlessly & without a lot of mess. All you have to do is cut the pomegranate in half and submerge in a bowl of water. Break apart the pomegranate while it is submerged and the seeds will come out easily. Then the membranes from the pomegranate float to the top of the water. Scoop the membranes out & drain the water. That’s all there is to it! Try it! It really works! Haluleljah! I needed this-you’re my savior.